STILLWATER — Max Hewitt didn’t start Tuesday’s game, but he finished it. 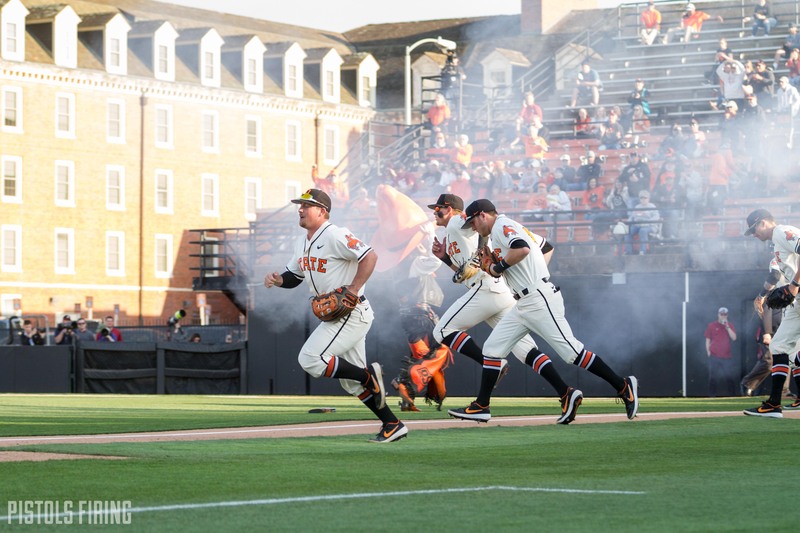 The Oklahoma State baseball team defeated Oklahoma 6-5 in Allie P. Reynolds Stadium’s final Bedlam game after Hewitt, who entered the game in the eighth inning, hit a walk-off single. Hewitt’s teammates mobbed him around first base. The celebration came to a jarring conclusion, as the umpires called everyone off the field to review if Noah Sifrit’s foot touched home plate. Once it was confirmed that it did, the OSU dugout swarmed Hewitt again. Sifrit’s arc was as interesting as Hewitt’s. Sifrit entered as a pinch runner after Jake Taylor hit a single in the ninth. Sifrit, a pitcher, had to jog to first base from the bullpen. He went on to steal the first base of his collegiate career. He advanced to third on a fielder’s choice before scoring the game winning run. For the first few hours of Tuesday’s game, it didn’t look as if the Cowboys were going to need a walk-off. The Cowboys scored five runs in the second inning and led 5-2 until the eighth. In the eighth, OU scored three runs thanks to three OSU errors, tying the game at 5. OSU closer Ben Leeper started the ninth on the mound. Leeper hasn’t allowed a run this season, and that didn’t change Tuesday night as he sat the Sooners down in order leading to Hewitt’s walk-off. Here are five thoughts from Tuesday night. Allie P. Reynolds Stadium’s first Bedlam game came on April 25, 1981. The Cowboys got shut out 9-0 that day. It looked for a moment that the two OU victories were going to bookend the stadium’s history, but Allie P. had a flair for the dramatic. The victory was the Cowboys eighth straight win against OU. The Cowboys haven’t lost to OU in Stillwater since April 15, 2014. It seemed as if the baseball gods didn’t want OSU to lose that one either, as that game went 18 innings. Before that, it had been since 1999 that the Sooners had won in Stillwater, with most of the Beldam series being played in Oklahoma City and Tulsa. Reynolds Stadium has seen 34 Bedlam games — 19 OSU victories, 15 OU victories. Since Holliday took over in 2013, OSU is 21-6 against the Sooners regardless of location. Holliday didn’t get too sentimental with Tuesday being the last Bedlam game in Allie P., but he didn’t undermine the rivalry’s importance. Before the Sooners’ three-run eighth inning, Holliday made some changes to his defense. Andrew Navigato moved from shortstop to third base, Christian Funk moved from third to first, Hewitt went from the dugout to shortstop, and Alix Garcia went from first to the dugout. The switches were made to strengthen the Cowboys’ defense to protect their 5-2 lead, but it all unraveled rather quickly. The eighth inning saw three errors. Funk dropped a ball at first on a sure out, then Navigato mishandled a tough hop at third. It looked as if the changes might have doomed the Cowboys. Hewitt got to the plate in place of Garcia in the nine hole. Garcia had smacked a three-run home run in the second inning, but Hewitt saved the Cowboys with his walk-off single. Holliday said if he could do it over again, he would have probably left the team as it was because they were playing well. C.J. Varela started Allie P.’s final opening day game on Feb. 20, and he started Allie P.’s final Bedlam game Tuesday. Varela went six innings against the Sooners, allowing one hit and two runs. He threw 100 pitches and had a career-high seven strikeouts. He hit a bit of a rough patch in the fourth inning, where he allowed a two-run home run, but it was important OSU pitching coach Rob Walton got as many innings out of Varela as he could with a tough TCU series coming this weekend. So, Varela toughed it out and made it through six. Jake Taylor has only had 17 at-bats this season, but he has made them count. He was OSU’s designated hitter against OU and hit he did. He finished the game 3-for-4 with an RBI and a run scored. His RBI was the first of the game and came off a double to left center. Although he has fewer at-bats than most, Taylor now leads OSU with a .353 batting average. Three of his six hits have been for extra bases, as he has two home runs and the double. Carson McCusker has started all 23 of OSU’s games this season. He has had at least one hit in 17 of those games, and he has a hit in all of OSU’s past eight. McCusker, a massive 6-foot-8 outfielder, was 2-for-3 with an RBI, a run scored and a drawn walk Tuesday.